It is a big deal to finally see Orson Welles’ “Chimes of Midnight” as it was only recently made possible to view what is considered to be a masterpiece from the writer/director since it was tangled in distribution rights. For a film that was initially maligned by critics and eventually praised as one of Welles’ best, it had unfortunately not received the audience it deserved. The rare screening of the film in art house theaters over the years found the film in dire need of good cleaning and thanks to Janus Films, we can now see a beautiful, crisp, full-restored print in American theaters for a limited time. 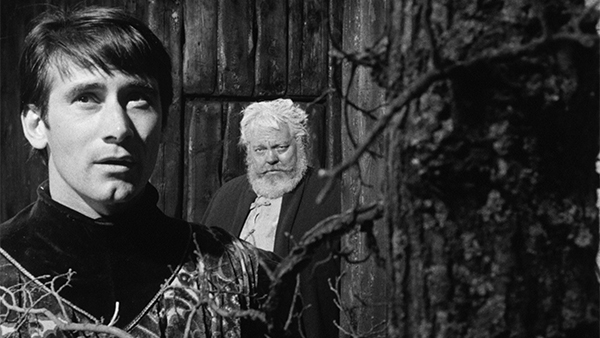 Film enthusiasts, Welles completists and lovers of William Shakespeare shouldn’t miss it. For “Chimes at Midnight” (or “Falstaff” as it was often called), Orson Welles culled material from five of Shakespeare’s plays (bits of Henry IV, Henry V and Richard II, to name a few) to focus on the Bard’s recurring comical character, Sir John “Jack” Falstaff (whom Welles portrays) the rotund loyal knight who’s seen many incarnations on stage and screen. In “Chimes”, Welles takes an entertaining supporting character from the early 15th century and puts him front and center, surrounding by his own host of supporting characters within an environment of towering castles and massive cathedrals. As the film opens, we see Falstaff and his friend, Justice Shallow (Alan Webb), laboring their way across a wintry hill, eventually arriving at Boar’s Head Tavern where they rest and recount tales of yesteryear. 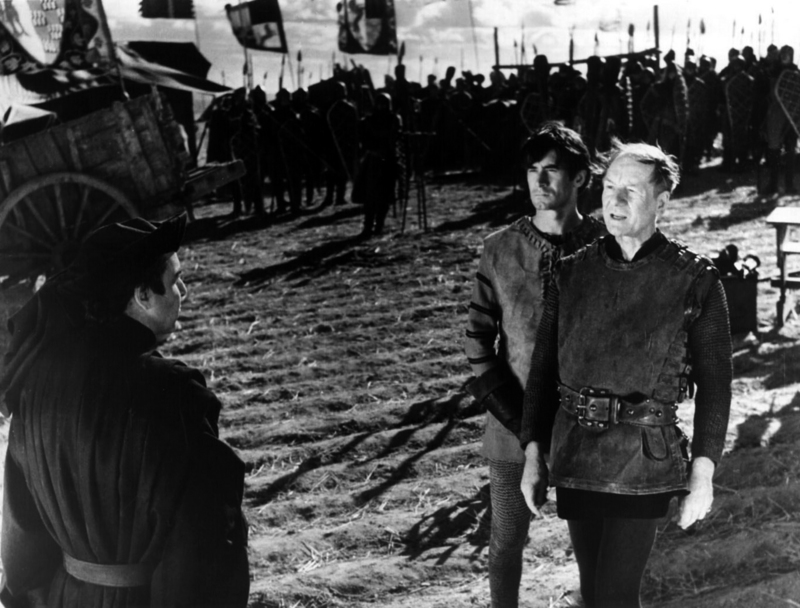 Then we hear a narrator (Ralph Richardson) explain the setting – how King Henry IV of England (John Gielgud) has killed and succeeded Richard II and how the deceased king’s heir, Edmund Mortimer is imprisoned in Wales, leaving his cousins Northumberland (José Nieto), Worcester (Fernando Rey) and Northumberland’s son Henry Percy (Norman Rodway), demanding that Henry rescue Mortimer. When refuses, the three embark on a plot to overthrow the king. Meanwhile, Henry’s rightful heir, Prince Hal (Keith Baxter) spends his time carousing around with his friend and surrogate father-figure, Falstaff, much to Henry’s dismay. The two find companions in the criminals, thieves and aimless youth who frequent the tavern, managed by Mistress Quickly (Margaret Rutherford). 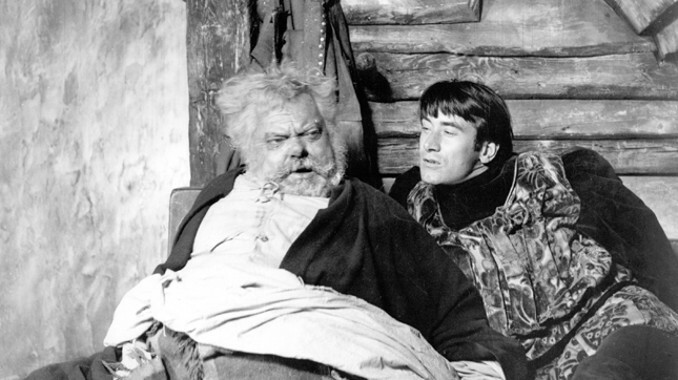 Among them, Bardolph (Patrick Bedford) Poins (Tony Beckley, in his film debut) and Pistol (Michael Aldridge), all of whom often enjoy humor at the expense of old Falstaff. As the story progresses, we see how their relationship between Hal and Falstaff becomes strained and eventually resulting in the prideful Hal donning the crown of his father (who deteriorated and died) and banishing a broken-hearted Falstaff out of the kingdom. It becomes clear in the end that “Chimes” is Welles offering viewers a study of friendship and betrayal and ultimately, a sad tale of dejection. There are moments of delightful comedy, like when Falstaff, Bardolph, Peto, and Poins disguise themselves in Gadshill in order to rob a group of oncoming pilgrims, only to be tricked by Hal and Poins, who jump out in other disguises and take the stolen treasure from Falstaff as a prank. Later on at the Boar’s Head, Hal and Poins let Falstaff boast about how the money was snatched from him and while it is a light-hearted time, there is a building feeling that there is sadly a certain making-fun-of-the-fat-guy truth behind the good time. One can’t help but wonder if this was one of many reasons Welles gravitating to the character. “Chimes” isn’t just talking heads spouting Elizabethan musings, there is also one of the most impressively brutal and fluid medieval battle sequences I’ve ever seen. If you weren’t already suspecting it, the Battle of Shrewsbury will take you by surprise as one might not expect Welles to be a filmmaker who can masterfully capture battle action on film. Nevertheless, there it is – archers, knights on horseback and warriors on foot, all clashing, while the cowardly Falstaff hilariously cowers in nearby brush. He witnesses young Hal kill Henry Percy in a duel and later on Falstaff claims before the king that it was he who killed Northumberland’s son, spurring resentment from Hal. It’s a bad move on Falstaff’s part, but understandable considering the character’s insecurities and guilt of his own behavior on the battlefield and reveals a sense of people-pleasing that drives him. For someone who’s often seen by those he respects as a joke, Falstaff seeking approval or praise is a sad yet sympathetic sight. As someone who is gradually taking in Welles’ filmography, it is this film that finds me most impressed by the artist’s work. Granted, I’ve yet to see more of his work beyond “Citizen Kane”, but there is something about Welles’ portrayal of Falstaff that touched me in an unanticipated way. Sure, he looks like a drunken Santa, but the Kenosha, Wisconsin native definitely has a mastery of the Bard’s language, but his acting is soulful and layered, offering natural nuances to his performance and it finds me wanted to look up his MacBeth and Othello films from the 40s and 50s. Welles acting definitely carries the film, but Baxter and Gielgud are phenomenal as well. French actress Jeanne Moreau plays prostitute Doll Tearsheet and Marina Vlady portrays Henry Percy’s wife, Kate. 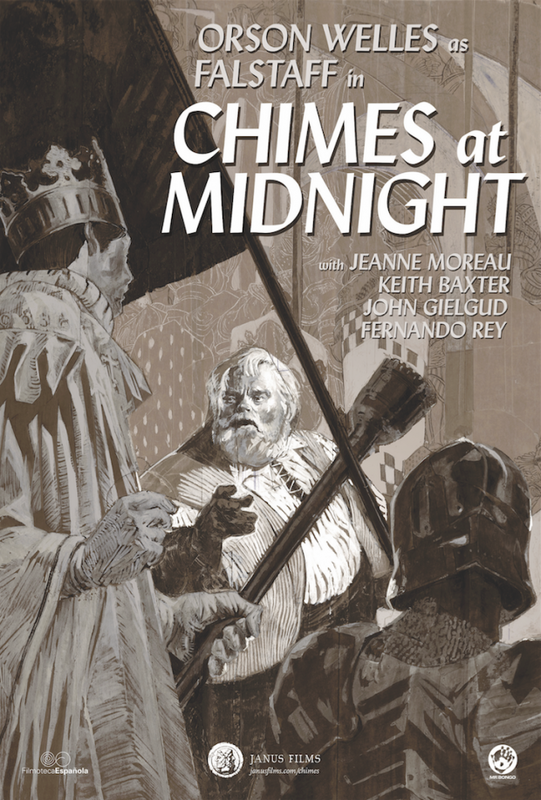 What I found most interesting about “Chimes at Midnight” is how, as an adaptation of Shakespeare’s work, it chooses to focus on characters that had previously been given supporting roles, such as Falstaff – and yet here Welles takes his perspective. 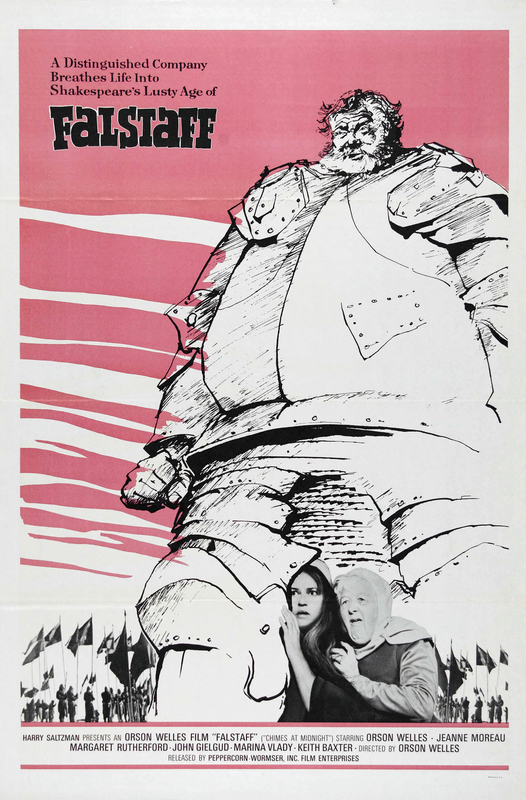 Falstaff is obviously a rich and entertaining character – one that became the inspiration for Stan Lee and Jack Kirby’s Volstagg in Marvel’s Thor comics and also a character that Spielberg had in mind for Sallah, the John Rhys-Davies role in “Raiders of the Lost Ark” – that it is only fitting that the role be portrayed here by an actor with an equal larger-than-life quality. Welles clearly has a fondness for the character and is concerned with giving Falstaff the attention he feels he deserves. Filmed in Spain in 1964 and 1965 as Welles struggled to finance the project, finding the director lying to his producers, telling them he was making a iteration of Treasure Island. Another testament to the filmmakers determination. Eventually, it premiered at the Cannes Film Festival in 1966, where it won the Palm d’Or and the Technical Grand Prize. That last award is no surprise, since the standout of the film is how it is looks. Shot in black-and-white (I couldn’t imagine it any other way), the cinematography by Edmond Richard is impressive, yet also strikingly varied in its approach. Richard uses Welles affinity for low-angle shots, but also employs crosscut edits and seemingly hand-held coverage with many over-the-shoulder shots that immerses viewers in the locations, be they cramped hallway of Boar’s Head or an immense church during a coronation ceremony. There are also beautiful long shots that establish locations or track movement that are quite breathtaking that found me even more impressed with Welles’ talents. It’s only a matter of time before Janus Films and Criterion team together to release the restored film on Blu-ray/DVD, but in the mean time, it’s been slowly receiving limited theatrical runs in the States since this past January. It will open today at the wonderful Music Box Theatre in Chicago for a one-week run. On several levels, “Chime at Midnight” is a masterpiece and for so many who haven’t yet seen it, watching the film will be like unearthing a treasure. Great review. The Battle of Shrewsbury sequence is one of my favorite battle scenes of all time. Check out The Lady from Shanghai and Touch of Evil next.